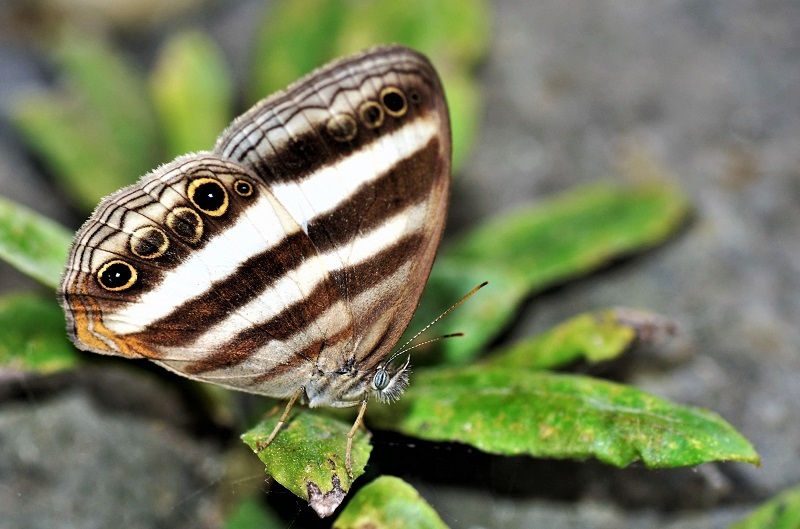 The two-banded satyr or banded white ringlet is a species of butterfly of the family Nymphalidae. It is found from Mexico to northern Argentina. The wingspam is about 37 mm. Its habitats are diverse and include lowland secondary rainforest, cloudforest up to about 1900 m and disturbed forest edge habitats including roadsides. The butterflies tend to be more abundant during the rainy season, and are most active when the sun reappears after heavy rainfall. Well visible Rings. Quite wrll captured.I like your technique to get rid of distracting background although those leaves well so close to butterfly. Details look good as well as exposure on white band. More then this are my expectations, as the focal length turns 157.5mm on DX format also well enlightened the subject. Lovely capture o a very nice specie of butterfly. Impressive details and natural colors. Very nice photo of this butterfly with a great sharp focus on the head. Beautiful colours in beautiful light.Well chosen composition.